How Can a Quantum Computer Pose a Threat? There are two main concepts behind the quantum computer: superposition and quantum entanglement. The superposition allows a quantum bit (qbit) to be in several states at the same time, and with the help of quantum entanglement, the observer can find out the parameters of a particle in any position in the universe. The connection is preserved, even if they are moved into different parts of the Universe. In essence, a quantum computer can process and analyze infinite bits of information at the same time — and so quickly and differently than the human mind cannot grasp it. ... In 1998, Daniel Loss, one of the authors of the current study, came up with a proposal, along with David DiVincenzo of IBM, to build a quantum computer by using the spins of electrons embedded in a quantum dot—a small particle that behaves like an atom, but that can be manipulated, so that they are sometimes called "artificial atoms." In the time since then, Loss and his team have endeavored to build practical devices. How quantum computers will make 5 unsolvable computing problems disappear. ... 90 percent of all data produced in human history was produced within the last two years. ... MIT partnered with Google to mathematically demonstrated the ways in which quantum computers, when paired with supervised machine learning, could achieve exponential increases in the speed of data categorization. ... governments are investing heavily in quantum computer systems research as are major tech titans like Google and IBM. These developments are expected to begin impacting the 5 areas of the economy we looked at within the next decade, and maybe as early as 2020. The microchip - which is 1.5cm wide, 5cm long and 0.5cm thick - has components inside that interact with light in different ways. These components are connected by tiny channels called waveguides that guide the light around the microchip, in a similar way that wires connect different parts of an electric circuit. ... Associate Professor Andrey Sukhorukov said the metasurface camera lens was highly transparent, thereby enabling efficient transmission and detection of information encoded in quantum light. ... two entangled photons contained in a single strand of fiber-optic cable—is the "smallest quantum computer you can imagine. This paper marks the first demonstration of our frequency-based approach to universal quantum computing." "A lot of researchers are talking about quantum information processing with photons, and even using frequency," said Lukens. "But no one had thought about sending multiple photons through the same fiber-optic strand, in the same space, and operating on them differently." 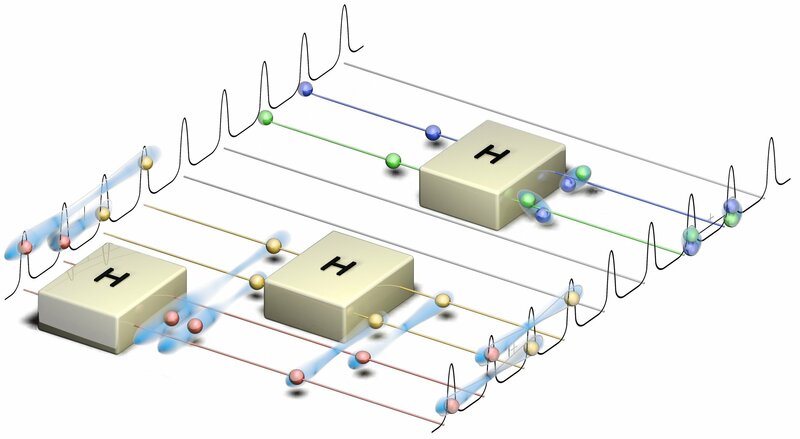 The team's quantum frequency processor allowed them to manipulate the frequency of photons to bring about superposition, a state that enables quantum operations and computing. 1. Quantum computing aims to take advantage of unusual properties that matter exhibits once we begin to study it at a level of detail below atomic level – the sub-atomic, or quantum level. 2. While conventional computer use binary “bits” (one and zero) as the process for calculation, a quantum computer uses quantum bits, knows as qubits – which can exist in both states simultaneously, as well as many other states in between. 3. Qubits exhibit properties of quantum entanglement – a phenomenon that means pairs, or groups, of particles cannot be measured or described independently of each other – they are “entangled” and their state depends on that of other particles in the group. 4. Due to factors which are still not fully understood despite the best efforts of Einstein, Shrodinger and many others since, it appears that particles linked in this way can transfer information between each other, even though, theoretically, they could be an unlimited distance apart. 5. Computer scientists working on quantum computers believe that in the future it will be possible to harness these mechanisms and build computers which will be millions of times more efficient that anything available today. 6. The possibility of quantum computing was first proposed by physicist Richard Feynman in 1982. 7. In 1994, mathematician Peter Shaw demonstrated how quantum computing could be used to crack the common encryption standards available then – many of which are still in use today. 8. DARPA brought online the world’s first operational quantum network in 2003, breaking new ground in the fields of quantum computing as well as secure communications. 9. The world’s first dedicated quantum computing focused commercial business – 1Qbit– was established in Vancouver, British Columbia, in 2012. 10. IBM launched Q, which offers 5 qubit quantum computing services via cloud in 2016. Last year it upgraded to 20 qubits of quantum processing power. 11. Organizations which are publicly known to be making use of D-Wave’s quantum computing infrastructure include Google, NASA and Lockheed Martin. 16. Geordie Rose, CTO at D-Wave: By 2028 intelligent machines will exist that can do anything humans can do. Quantum computers will have played a critical role in the creation of this new type of intelligence. 17. Quantum computing requires extremely cold temperatures, as sub-atomic particles must be as close as possible to a stationary state to be measured. The cores of D-Wave quantum computers operate at -460 degrees f, or -273 degrees c, which is 0.02 degrees away from absolute zero. 18. Quantum computing is often described as “natural”. This is because although we don’t completely understand them, the mechanisms underpinning the real world (which have evolved through nature) clearly operate at a sub-atomic level. By simulating this with computers, we come a huge step closer to being able to simulate the natural world. 19. At a quantum level, science fiction appears to become reality. Particles can travel backwards or forwards in time and teleport (quantum tunnelling) between two positions. One possible explanation for why quantum computers work involves parallel universes. It has been theorized that qubits are able to exist in two states simultaneously because we are observing them in multiple universes simultaneously. Quipper uses linear types to model quantum states, although it refers to the data type as Qubit. The intuition is that the no-cloning theoremprevents you from making a copy of the quantum state of a qubit, so it makes sense to use the type system to prevent you from making a copy of the software representation of quantum state. Linear types have proven useful in other contexts where copying the software representation of an entity would be bad, for instance in functional concurrent programming, so why not for quantum computing?